AirPods are a quintessentially Apple product. They do something old in a new and enticing way. When they're announced, people dismiss or make fun of them. When they sell out, people become desperate to get them. Now, Apple has moved on to AirPods (2nd Generation), and I've spent over 10 days, almost 2 weeks with them, and here's what I've learned, both in terms of what I love, what I don't, what I want next, and who should buy now. Don't want to read? Hit play and watch the video version! With a new, optional, wireless charging case and dedicated H1 headphone chipset, AirPods take everything great — and not so great — about the originals and add faster pairing and switching, lower latency, extra talk time, and always-on 'Hey Siri' at your command. 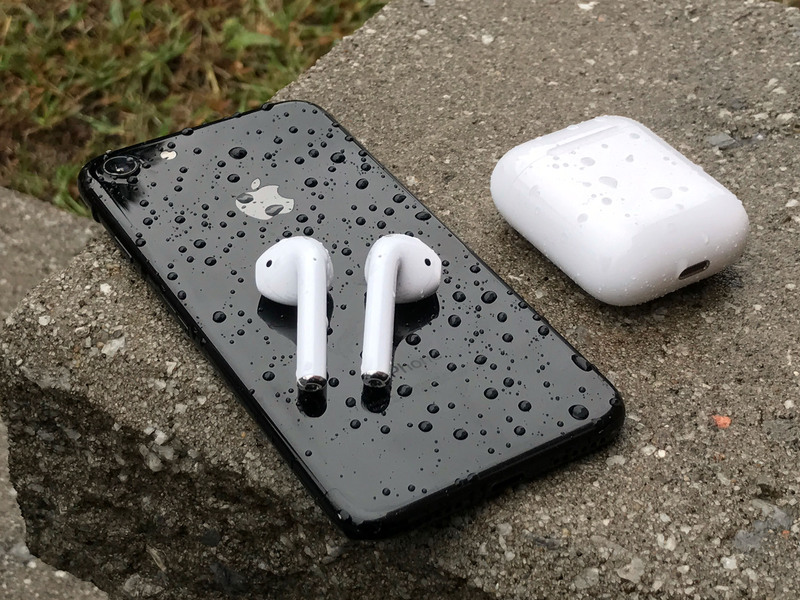 The second-generation AirPods are much like the first, so instead of repeating all the basics again, please check out the previous review. The first is the new Wireless Charging Case for AirPods. It looks nearly identical to the original, non-wireless case. There's a new hinge design, but it feels every bit as addictively clicky as the original. The charge indicator light has been moved from the inside to the outside so you can see the status without having to pick it up and open it. As before, green light means fully charged and good to go, and amber light means slow down and charge or are-charging. Also new, it has an inductive charging coil inside so you can drop it on a Qi-standard inductive charging pad, the same kind that works with any of the iPhones 8 or X models, and top it up without having to fuss with plugging it in. Charging happens at 5 watts, and doing it inductively with Qi does will always take longer than the old fashioned way. About one-and-a-half times longer until full. If you're leaving them on the pad overnight or while you're working, that's not going to matter to you. But if you need them charged faster, you can still plug them in via Lightning cable and get the job done in 2 hours instead of 3. That's right, Lightning. Any nerd hoping for any sign that, after the new iPads Pro, Apple would keep pushing USB-C down the line should probably stop hoping that, at least for now. And all the normal non-nerd folks oh so happy they can keep using the kajillion Lightning cables already in their collections, well, you keep doing happy you. Now, this was all originally designed to work with Apple's late, lamented AirPower charging pad so you could drop your iPhone, AirPods, and Apple Watch all on the same pad, all at the same time. But, since AirPower has been canceled, you now have to either have a pad you can alternate with your iPhone, a spare bad, or a third-party multi-charging pad you can drop them both on to really benefit from the inductive charging. I have a Qi charger on my desk so, if my iPhone isn't in dire need of topping up, which it usually isn't, I've started dropping my AirPods there instead. Which also aren't often in dire need of topping up, but they're newer so they're getting preferential treatment, at least for now. If you do likewise, it feels like the same magic as Apple Pencil 2 or the AirPod buds themselves — like the case is just always charged to the point that you start to forget it needs charging. Qi or no Qi, I love having the charging light on the outside so I'd say the convenience is worth it. And that's really the promise of Qi, and one that's still in the painfully long process of paying off. When I was at the Montreal airport the other day, there was a whole section with Qi chargers between every seat. I dropped my phone and topped up a bit while waiting to board. It was great, but it should be everywhere. Every gate at every airport, every table at every coffee shop and restaurant, every doctor's office, in every cab or rideshare, everywhere. That's when Qi charging will go from being a novelty to infrastructure, and all of our stuff will just always have power. Until then, if you're just interested in the new wireless case by itself, you have to be already invested in Qi charging pads for it to make any sense as an add-on to your original AirPods. If you need a replacement case, Qi or no Qi, I love having the charging light on the outside so I'd say the convenience is worth it. If you're getting new AirPods, get them with the wireless case. Even if you're not all-in on Qi, odds are it'll come in handy at some or many points over the next year or two. Especially if rumors are true and Apple starts including inductive charging out on upcoming products. The second big change is the H1 chipset included in both new AirPod buds. The old AirPods used the W1 chip but since W2 ran off with the Watch, Apple is now making dedicated silicon for headphones. Which is for the best, since wireless isn't just wireless and what you wear on your wrist is probably going to have different requirements than what you wear in your ears. You can't see any difference from the outside, though. The buds still look identical to EarPods and the stalks look the same as the previous model. I know some people still mock them or think they look weird which, can I say, I find more than a little weird. The idea that having wires going all the way to your waist is somehow more aesthetically pleasing than just the stalks is just a joke our change-resistant brains play on us. Soon enough, it'll be the wires that look tragically antiquated and weird. For now, the stalks still help make space for a bigger battery and help get lower down your jaw for better mic performance. Which is why AirPods don't sound as crap on the other end of calls as competing buds. I get that the white color does make them standout, though, unlike the giant black and gray Galactica actual earpieces of the past. And, as much as I would have loved options for a classier black or even a more attention-getting Product Red, Apple is sticking with the same white that iPod made iconic. I'm not saying I want or need seasonal AirPods socks in papaya or hyper grape, but I'm not not saying that either. It's fine, if a little humdrum from the company that showed with Apple Watch that wearables can and should be fashionable. Now, I'm not saying I want or need seasonal AirPods socks in papaya or hyper grape, but I'm not not saying that either. And it's inarguable that the iconic white has been great for the AirPods, maybe even contributing to their enormous popularity. They're like little ear-born billboards, every one of them. Look no further than all the AirPod memes. So many memes. More than even Elon could review. It makes them so singularity identifiable it's hard to see Apple giving that up any time soon. Which is why, socks. Kidding. Kinda. The buds themselves are the same, as well, which will be great news for most people and continued tragedy for everyone else. If you're new to my Apple pod reviews, the original EarPods stayed in my grappling mangled ears not at all. The tension on the wires was enough to just pull them out constantly. AirPods are better. The left one is rock solid for me. The right one a little loose goosey. And yeah, you can hack or adapt your way around that, but not with any help from Apple. This is one of those cases where the 80/20 rule just shouldn't apply. AirPods should be truly amazing for everyone. Come up with a design that, out of the box, can always be made to fit, even if it does need to include in-the-box adapters. Seriously, leave no ear behind. Because, right now, it's a bummer if you want them to work out for your workouts and they just don't. Work because out, that is. There are also some big features the new AirPods still don't have. No iPhone-style water resistance, no Apple Pencil 2-style soft touch texture, no Apple Watch-style health sensors, no Bose-style noise cancelation. If you've been waiting on any of that, you'll have to keep waiting. Or, come May, check out the just-announced, also H1 powered, Powerbeats Pro, that are around-the-ear and in-ear, are much bigger, lack a capacitive charging case, but are water and sweat resistant, have noise isolation, and come in ivory, black, navy, blue, and moss green. What you do get is Bluetooth 5.0 support, which makes the H1 AirPods faster to connect and to switch between devices, and are more stable when connected, compared to the old W1 AirPods. Over the last week or so, that's matched up with my experience. Where, previously, I could probably count to 4 or 5 when connecting or switching, now I can pretty much count to two. Where, previously, I'd sometimes have to tap or click two or three times to switch between my iPhone and Mac, now it almost always happens on the first tap or click. iPhone to Watch and back has always been near instant for me, but the improvement between iPhone and Mac, which is what I do most, is worth the price of admission for me alone. Especially the Mac, where the new AirPods just show up in the audio options faster and more consistently, and lock on far quicker, than the old ones ever did. They still can't stay connected to multiple devices at once, which I know some people would prefer but I have mixed feelings about. I often have audio kick in on my Mac, for example, like an embedded video or a download getting kicked over to iTunes, where I wouldn't want last-source-wins to take over my AirPods. We effectively have that already with Apple Watch, but I've never started audio or had audio start on my Apple Watch that I didn't want to listen to, and I have on pretty much every other device. Being able to connect multiple AirPods to one device would also be handy, especially when you're traveling together and want to share. For now, two people can grab one AirPod each, which is fine for podcasts, even audio books, but not so great for music or movies. Whether Apple could add that without interfering with the existing super silky smooth pairing and switching system, I don't know, but it's on my wishlist and even higher up than AirPod socks. H2 also provides for 30% lower latency, which its great for gaming and, while I still need to dig deeper into this and talk to people in the community about it, I'm very much hoping for audio accessibility needs as well. If you've been using them for that, let me know how it's going in the comments. They also connect to calls 2x faster, which I really appreciate. In the past, it could be a bit stressful taking a call and trying to switch to AirPods, and either hoping it would work and you wouldn't miss anything important, or making a joke out of it as other people on the call were switching as well. And, since nothing wireless worked better of faster, it was just something everyone learned to live with. The new AirPods are really fast to connect, switch, and take calls. Like, really fast. But, now, it's really fast. Like, really fast. So fast I haven't had any stress kick in at all, and likewise when I've talked to people on the other end switching to the new AirPods as well. I mean, it's still switching to wireless, which still isn't the same as switching between built-in mics and speakers, but the gap is getting real small. H1 is also more efficient than the W1 in the previous AirPods, at least when it comes to talk time. Apple promises the same 5 hours of listening time but, now, up to 3 hours of talk time on a single charge. And if you do happen to run out, like if you use them to record back to back to back podcasts like I often do — or, sure, fine, phone calls with other humans — you can take a quick break, and charge them back up to 3 hours in just 15 minutes. The other thing H1 enables is always-listening Hey Siri. Previously, you had to double tap your AirPods to trigger Siri and relay commands to your iOS device. Now, you just say Hey Siri. That might not sound like much of a difference on paper but it really is in practice. I've said this many times already, but humans aren't great at context shifting. It's interruptive. So, any time we can keep doing what we're doing and just add something extra, that's way better than stopping, shifting, and coming back. And that's exactly what Hey Siri enables. I can just walk around, setting up gear, doing housework, cooking training, or whatever, and never even think about stopping and tapping my AirPods. I can just say Hey Siri, turn the lights purple, Hey Siri, add eggs to my shopping list, Hey Siri, set a timer for the pasta, and my new absolute favorite, Hey Siri, play Infinity War on my Apple TV. I know some people say they find it slow but like 4 out of 5 times for me, it's just as fast as any device and that other time isn't really slower than it can be on any other device. Hey Siri, play Avengers: Infinity War on my Apple TV is my absolute new favorite. Also, Apple has improved the mic to better recognize Hey Siri, and as an added benefit, better cancel noise like wind when you're talking. The audio out is still the same as the previous AirPods, so they don't sound any better, but the audio in is improved so you will sound better. Sure, HomePod could already do all of that, and so could any modern iOS device you have lying around or on your wrist, but you can whisper to AirPods and when they answer back, it's in your ears and not out loud. And, of course, your HomePod stays at home or in the office. AirPods go with you anywhere. That's where I've found it most useful — when I'm out and about and my iPhone is in my pocket, my iPad is in my pack, and yeah, I could raise my watch, but I don't even have to. It's everything Apple got right with far-field on HomePod made Near-field with AirPods. Like both sides of the same equation coming together. I can just say Hey Siri, like something out of every Iron Man movie, and get things done. If you have the original AirPods and they're still working great for you, there's not much reason to upgrade. You can get the inductive charging case on its own if that's all you want, but I'd still recommend getting the new AirPods along with it because they also give you the better pairing and mic performance and Hey Siri support. Likewise, if your original AirPods have gone through enough charge cycles that the battery doesn't last any more, I'd go for a second gen rather than a simple swap. If you've never had AirPods before, though, then these new, second generation AirPods are a real treat. They're faster, more convenient to charge, make you sound better, and give you Hey Siri right in your ears. All of the same price as the originals, plus the new wireless case if you want it.